Several years ago I made my girls several bottles of colored glue for them to use in arts and crafts. Mostly they just enjoyed squeezing the glue out in big puddles, or they'd make rainbows, or squeeze globs that they'd stick beads in. 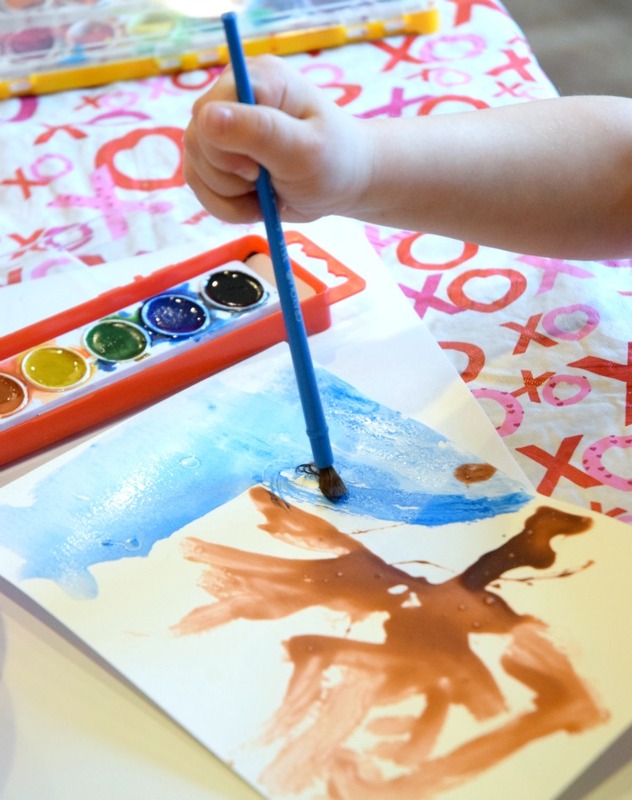 It's funny how a little color can turn such an ordinary art supply into something fantastic! 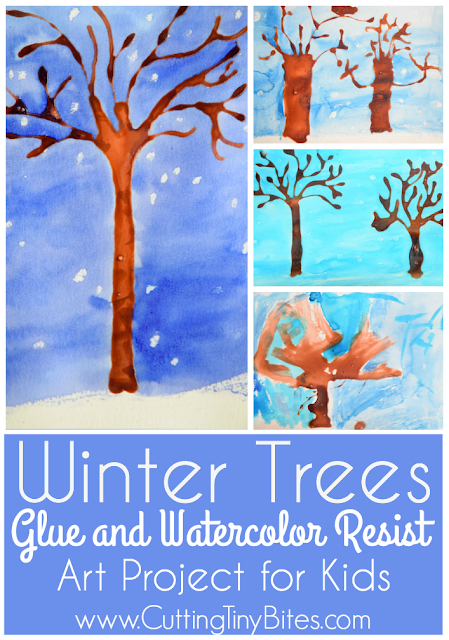 Colored glue ended up being the perfect supply to make these Winter Trees With Watercolor Resist. The materials made such a pretty winter landscape. Your first step is to mix up some brown glue. I used a bottle of regular Elmer's school glue that had about 1/3 left. 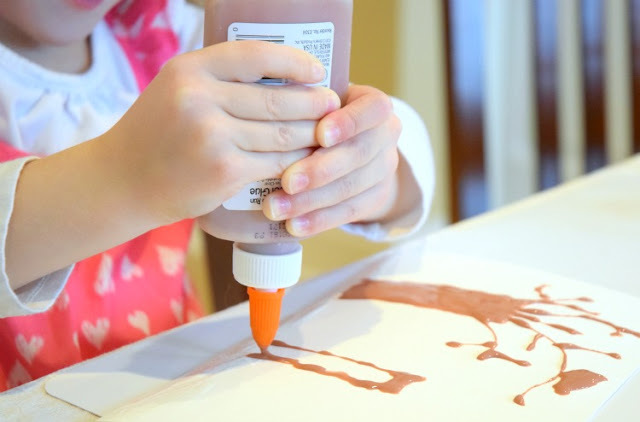 Add a generous squirt of brown child's craft paint and stir it up until the color is consistent. The glue will dry darker than it looks in the bottle. Our watercolor paper was 9"x12". I've found that my girls do better with smaller projects; I cut sheets of paper in half, so that they were working with 4.5"x6" paper. You could cut your paper to any size that you wanted. We started by looking out our window to observe the bare trees in our yard and neighborhood. The girls made observations about the shape and size of the trunks, limbs, and smaller branches. 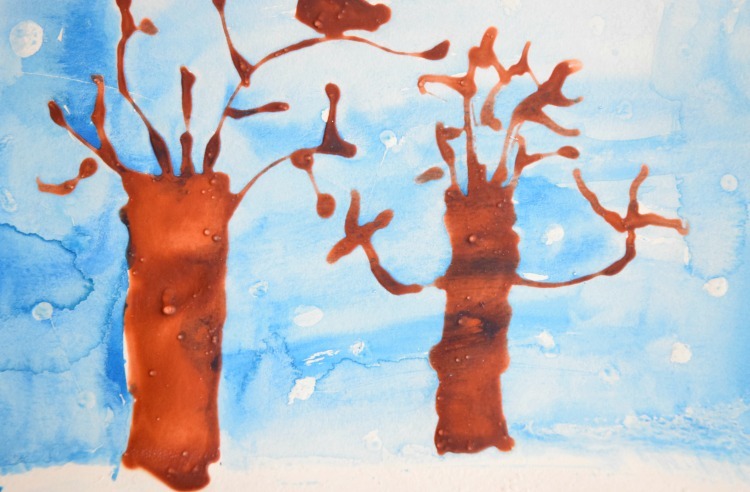 Then the girls practiced drawing a few trees on paper. When they felt ready, it was time for the glue! 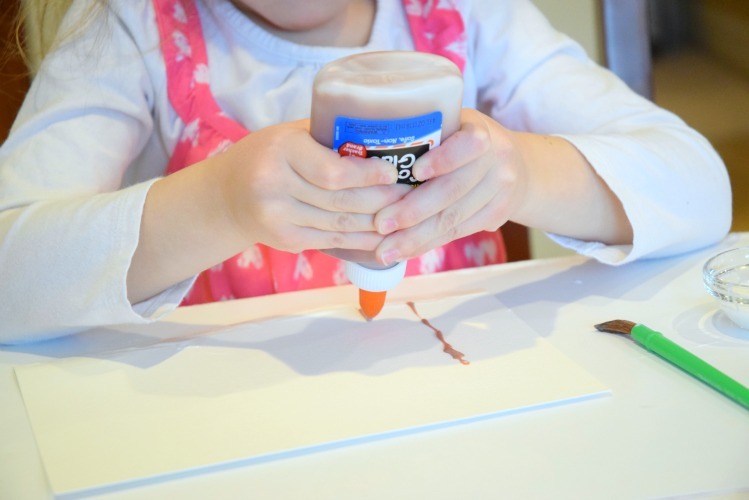 Let your child squeeze glue to form a thick tree trunk and several branches. 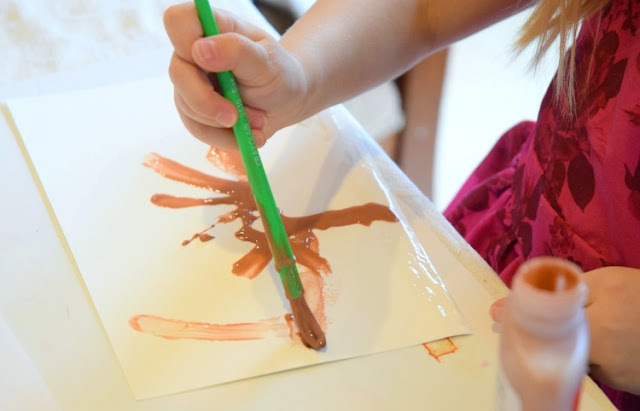 All that squeezing is great for developing muscles in hands and fine motor skills. 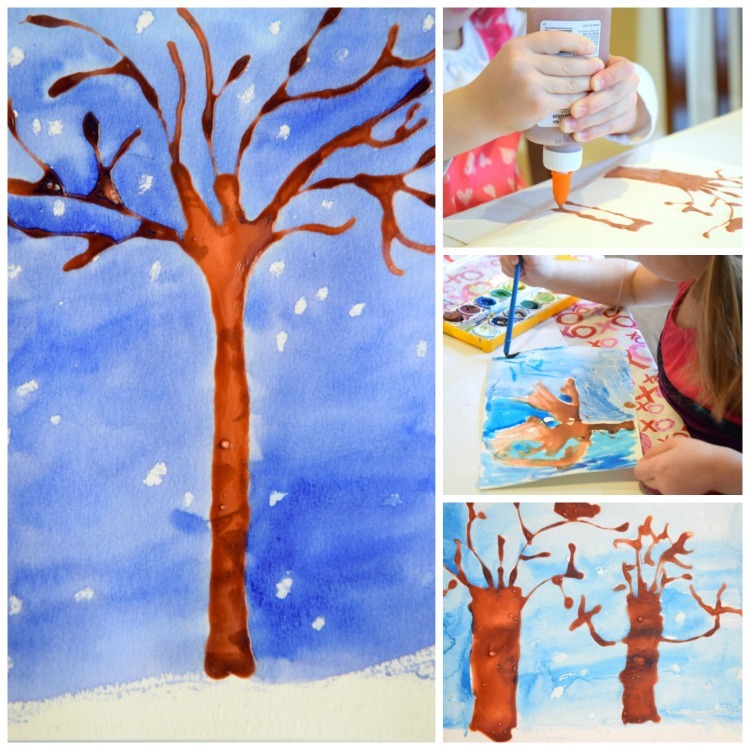 Something about the way the glue drapes along the paper makes it a perfect material for making tree branches! Natural globs and thicker spots of the glue look like knots and variations in the tree's structure. 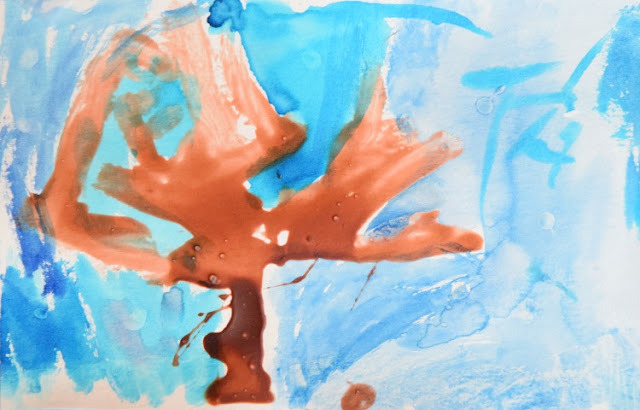 Maggie got tired of squeezing and asked to paint her tree with a brush instead. No problem. 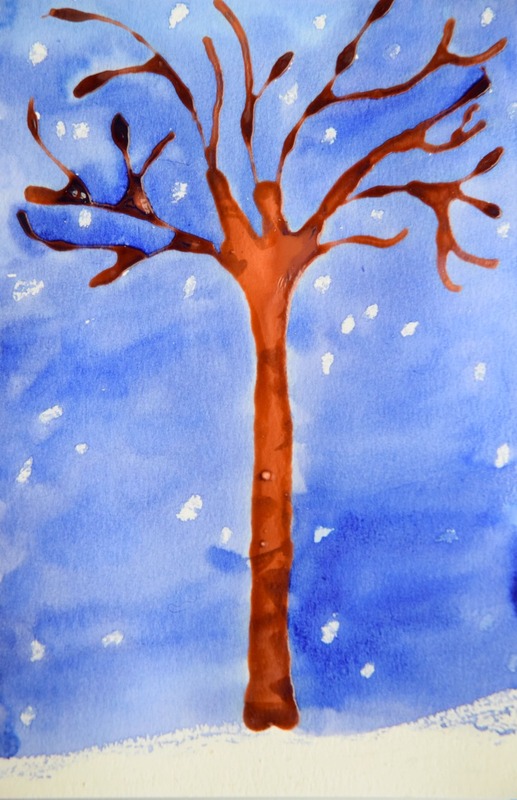 If you want to add a snowy ground and snowflakes, use white oil pastels to do so. We initially tried to do it with plain white glue, but the watercolor ended up covering it up. Oil pastels worked much better! Set the trees aside to try. We waited overnight and finished the next day. Once the glue has dried, use blue watercolor to paint a wintry sky. The natural variations of the color reminded me of a blustery, snowy, winter day! I love how well this project turned out for both of my girls. Oftentimes projects that 3-year-old Maggie enjoys aren't challenging (or interesting) enough for 5-year-old Lena. And similarly, projects that Lena enjoys are often too difficult for Maggie. This one hit just the right balance, and they were each so pleased with their finished products. Here is a 3-year-old version. Winter tree craft using glue and watercolor resist. 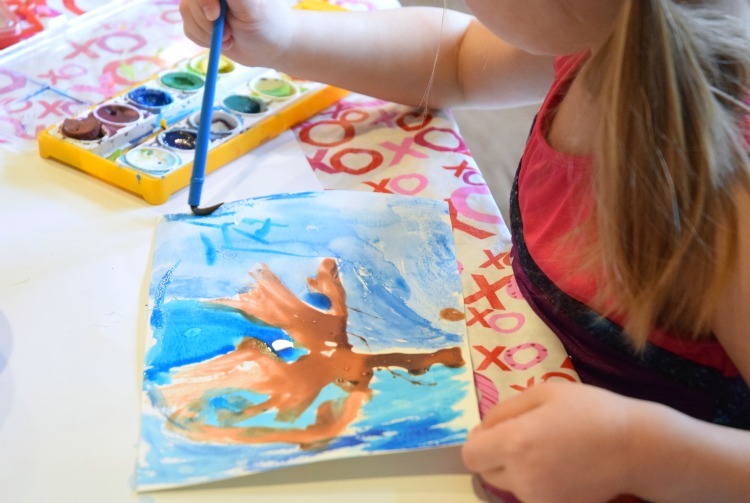 Easy painting project for preschoolers, kindergartners, and elementary kids.